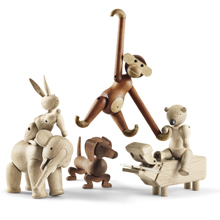 For collectors, design-lovers and friends of high quality wooden toys: the Danish company Rosendahl expands ist collection of Wooden Creatures from Kay Bojesen. Since already a few years, Rosendahl produces Bojesens apes, elephants and bears. Now the wooden creatures society gets the company of three old friends: after a long-term absence, sausage dog, hippo and rabbit have reentered production. Kay Bojesen designed his wooden creatures between the years 1935 and 1957. The Danish company Rosendahl produces the collection today, in close cooperation with his family.